← Help, My To-Do List it Way Too Long!!!! Ignore by Auto Deleting: If the conversation is truly useless, one way to handle this is to auto-delete all members of this conversation. You do that by selecting an item in the conversation and then clicking the Ignore Conversation on the Home tab (the command is in the Delete section at the left, see image below). By doing that, all current and future members of that conversation will be auto-deleted. Auto Filing: Auto-deleting can be a bit risky—you won’t even be able to search those conversations in the future. Better might be to automatically save all future messages from the conversation as they arrive into a bulk folder, directing them out of your Inbox. At least you can search those later. 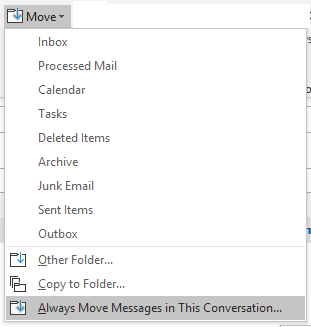 You could create a custom rule to do that, but much simpler is using the Windows Outlook command: “Always Move Messages in This Conversation.” This command automatically moves all current and all future messages in this conversation to a different folder. You won’t have to manually file them anymore! Steps: To use this command, select one of the messages in your Inbox, then go to the Home tab, and then find the Move command, and choose: “Always Move Messages in This Conversation” from the submenu (see figure above). Choose the folder to save it in. That’s it! To see more details on both of these commands, scroll to Lesson 1.13 at the Outlook Inbox Ninja Course page, that video is free to anyone who wants to watch it. This entry was posted in Uncategorized and tagged Always Move, Conversations, Ignore. Bookmark the permalink.